Provocative Chinese Cartoonists Find An Outlet Online In a Nemo-inspired cartoon, a menacing fish lures unsuspecting little fish with a glowing picture of a Communist hero. A South Park-like animation skewers China's elites. These are among the works of a new generation of Chinese political cartoonists who are using social media to evade censors. In this illustration by a Chinese cartoonist who goes by the name Rebel Pepper, an anglerfish, representing the Chinese Communist Party, hypnotizes smaller fish, representing the Chinese people, with the glowing image of a famous, model soldier — with the implied intention of devouring them while they're distracted. 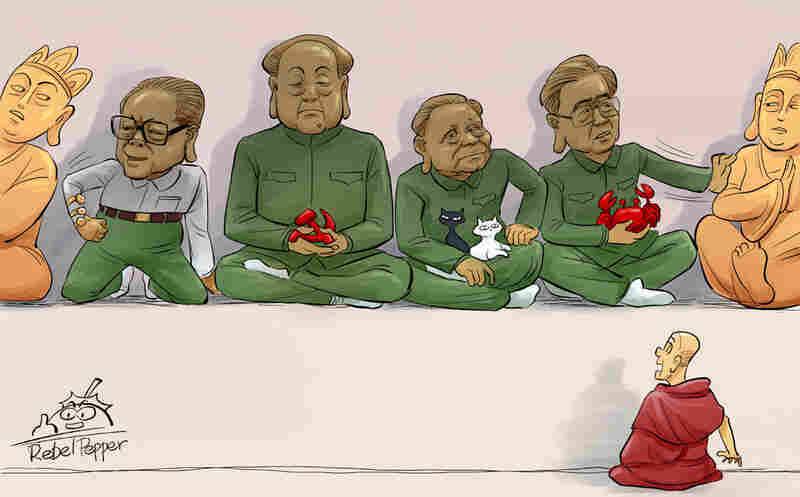 Chinese cartoonists have used the Internet in recent years to take aim at the Communist Party. Using Twitter-like microblogs, they try to slip past censors and skewer their government in ways that would have been unthinkable a generation ago. One of their targets this month is an old-fashioned Communist propaganda campaign extolling the virtues of Lei Feng, a model People's Liberation Army soldier who was devoted to his fellow workers and China's leaders — and who has been dead for half a century. The campaign included a 90-minute, televised, Broadway-style extravaganza where a chorus of marching construction workers, flight attendants and police officers belted out lyrics like "Study Lei Feng, good role model. Loyal to the Revolution, loyal to the Party." 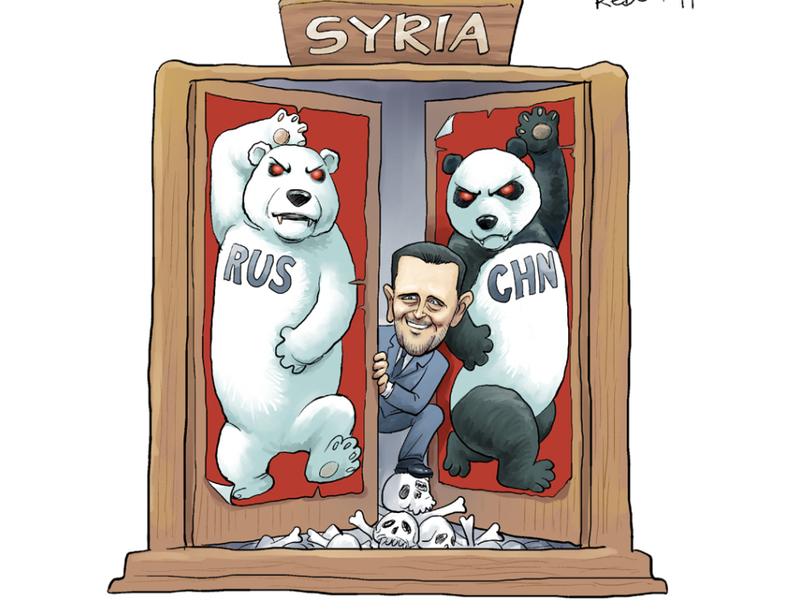 In this cartoon by Rebel Pepper, Russia and China defend Syrian President Bashar Assad amid the country's violent uprising. The image refers to the countries' veto of a draft U.N. resolution promoting regime change in Syria. In the past, many Chinese would have shrugged this off as Communist claptrap. Today, people openly mock it. "I am disgusted by the promotion of 'Learn from Lei Feng,'" says Rebel Pepper, the pen name of a popular Internet cartoonist. "That's why I drew the cartoon." Rebel Pepper's cartoon, which he posted on his microblog account, is inspired by the American movie Finding Nemo. 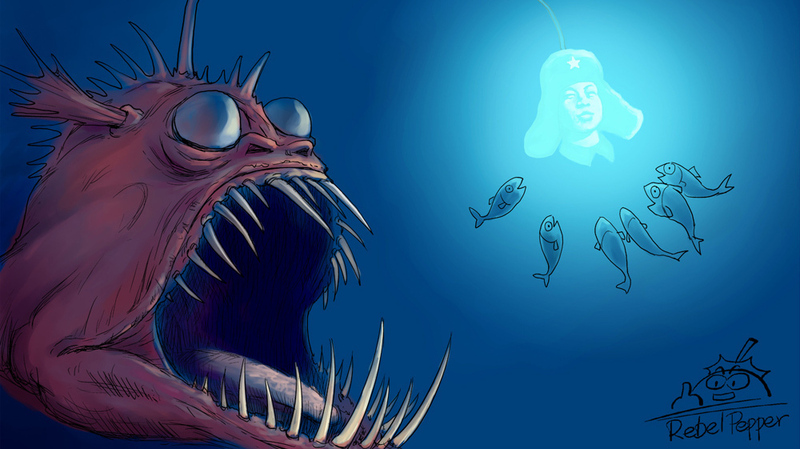 It depicts a giant anglerfish with menacing teeth dangling a glowing picture of Lei Feng. A school of smaller fish stare adoringly at the light, unaware they are about to be eaten. "The anglerfish represents the [Communist Party] and the government," says Rebel Pepper, whose microblog account has 90,000 followers. "He uses a glowing fishing rod to lure the smaller fish. The government still uses this sham image of Lei Feng to confuse gullible people." Rebel Pepper posted the cartoon on Sina Weibo, China's biggest microblog service, which has more than 260 million users. Despite its sharp tone, the cartoon hasn't been deleted, which is better than what often happens. Sina Weibo has erased Rebel Pepper's account 180 times in the past. Each time, he responds by opening a new account under a slightly different name. Other government critics have had it worse. "The highest record-holder is a guy I know," says Rebel Pepper, a warm, funny, bespectacled man who lives in central China. "His account was deleted more than 300 times." Newspaper cartoonist Kuang Biao publishes some of his more provocative images online, where there is relatively more freedom of expression. 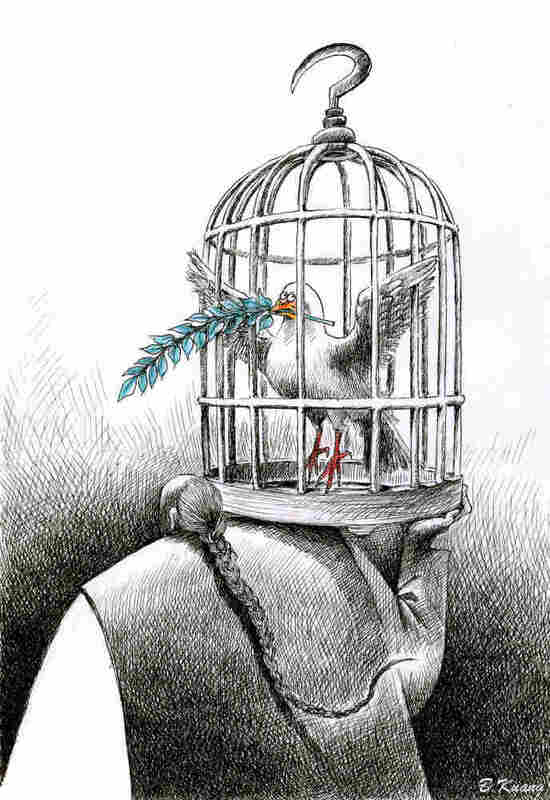 This cartoon refers to Liu Xiaobo, winner of the 2010 Nobel Peace Prize and political activist, who was barred from accepting his award and remains imprisoned in China. Political cartoons have emerged over the years as the Chinese media have become more commercial, and the Internet and microblogs have exploded. "This has dramatically changed the environment for cartoonists," says David Bandurski, a researcher with the University of Hong Kong's China Media Project. "They now have a really good platform to find an audience." Bandurski follows 20 to 30 cartoonists on social media, but suspects there are many more. He says the Communist Party still has ultimate control over media here, but the digital revolution and decentralized power have created openings for freer expression. "This is what we call chaos," he says, "and in this chaos, there is a lot you can do." And some things you can't. Pi San — also a pen name — runs an animation studio in Beijing, where he created a provocative animated short last year. Imagine if South Park decided to target the Communist Party and you get a good idea of what Pi San came up with. It's a dark fable where tigers, representing the party, abuse and even kill rabbits, who represent ordinary people. In one scene, baby bunnies drink chemically tainted milk. Their eyes fall out and they die. It's a reference to China's 2008 milk scandal, which left 11 children dead. China's top Communist leaders, including Mao Tse-tung and Deng Xiao-ping, edge out Tibetan deities before a horrified Tibetan monk. This refers to the government's mandate that a photo of the leaders be placed in Tibetan monasteries at a time when monks continue to light themselves on fire to protest Chinese rule. In another scene, a tiger drives over a rabbit. When confronted, the tiger says he's untouchable because his father is a powerful official. This is what happened in 2010 when a politically connected young man struck and killed a woman in northern China. Pi San says Web portals deleted the video the same day it was posted. "Internet companies are pretty cowardly," he says. "I think they are a bit sensitive, too sensitive. In China, Internet companies are expected to be the first line of defense. I think through self-censorship, they castrate themselves." That said, Pi San is optimistic about political cartoons and expects to see more of them. "I think in this society and era, because of the Internet, everyone can use what they are good at to voice their opinions," he says. "This, at least, is a self-awakening. We can speak our own ideas, not like before, when everyone watched and listened to the same stuff." Pi San is now at work on another animated short. It's about a school where people pretend to be blind, so they don't have to confront the ugly reality in front of them.